Cook chicken as directed on package in microwave until juice of chicken is no longer pink when center of thickest part is cut (170°F). Meanwhile, heat 10-inch nonstick skillet over medium-high heat. Add zucchini, onion and bell pepper; cook 4 minutes, stirring frequently. Stir in corn, tomato, chile pepper and cilantro. Reduce heat to medium-low; simmer uncovered 3 minutes or until vegetables are tender and mixture is thoroughly heated. Thinly slice cooked chicken; stir into vegetable mixture. 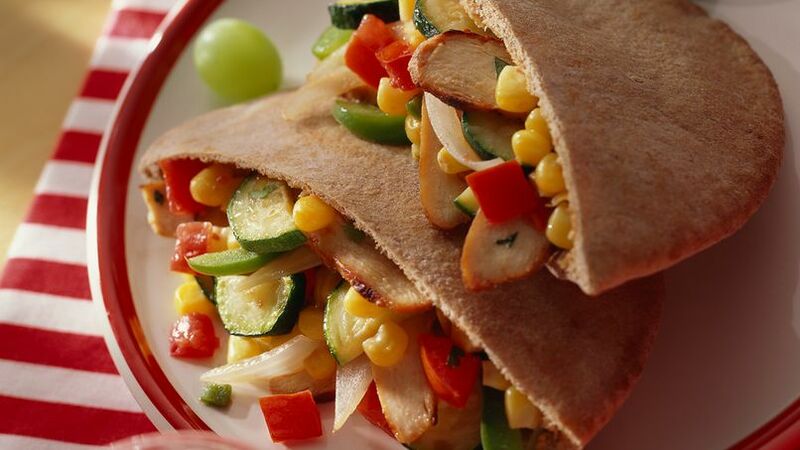 Fill each pita bread half with about 2/3 cup chicken and vegetable mixture. Wrap 2 sandwiches together securely with foil; take with you for an on-the-go dinner.